RSS and its off springs are master conspirators. In fact, RSS as fountain head of the Hindutva politicsis a gurukul of teaching the art of how to conspire and where to execute the conspiracies. It thrives by hatching conspiracies to undermine truth and destroy its adversaries. RSS like any other fascist organization relies on intrigues and it is through conspiracies that it attempts to legitimize its nefarious agenda. The purpose is to turn victims into perpetrators. The latest expose has come from Kerala. A leading English daily, The Indian Express wrote: “In what could be a major embarrassment for the BJP, a Yuva Morcha [youth wing of the RSS] leader apparently condemned a petrol bomb attack on the party’s Thiruvananthapuram office on the social media hours before the actual incident took place, triggering speculation that the attack was planned and executed by the saffron party itself.”[i] The Yuva Morcha leader Jayadev Hareendran Nair, a top RSS functionary in Kerala had put out three Facebook posts on Wednesday (June 7 at 8.01 am, 5.01 pm and 6.31 pm) condemning the attack on the BJP office where as the actual ‘attack’ took place between 8.30 pm and 9 pm. There is a long history of RSS and its offshoots using such deceitful tactics. Many of these are documented even in the RSS publications. Central publication house of the RSS, Suruchi Prakashan, Delhi, published a book in 1997, titled Param Vaibhav Ke Path Par (ON THE ROAD TO GREAT GLORY) penned by Sadanand Damodar Sapre, a senior RSS functionary. This book contained details of more than 40 organizations created by the RSS for different tasks but more importantly it described how many of these organizations are run in a clandestine manner in order to execute hidden agendas. “From the point of view of Hindu awakening this kind of forums [like Hindu Jagran Manch] at present are active in 17 states with different names like ‘Hindu Manch’ in Delhi, ‘Hindu Munani’ in Tamilnadu, ‘Hinduekjut’ in Maharashtra. These are forums, not associations or organizations,that are why it is not required to have membership, registration and elections.”[ii] (1) It is clear that such organizations with no record of membership, no registration and no internal elections are created by the RSS. Such an organizational model provides an opportunity to RSS to disown any individual or organization. The following passage from the autobiography of the first Home Secretary of UP, Rajeshwar Dayal, ICS, clearly shows the sinister and criminal designs of the RSS to organize a pogrom of Muslims in the western Uttar Pradesh (the largest province in the Indian Union) and thus break the unity of the country just on the eve of Independence. “I must record an episode of a very grave nature when the procrastination and indecision of the UP Cabinet led to dire consequences. When communal tension was still at fever pitch, the Deputy Inspector General of Police of the Western Range, a very seasoned and capable officer, B. B. L. Jaitley, arrived at my house in great secrecy. He was accompanied by two of his officers who brought with them two large steel trunks securely locked. When the trunks were opened, they revealed incontrovertible evidence of a dastardly conspiracy to create a communal holocaust throughout the Western districts of the province. The trunks were crammed with blueprints of great accuracy and professionalism of every town and village in that vast area, prominently marking out the Muslim localities and habitations. There were also detailed instructions regarding access to the various locations, and other matters which amply revealed the sinister purport. Greatly alarmed by those revelations, I immediately took the police party to the Premier’s [chief minister’s] house. There, in a closed room, Jaitley gave a full report of his discovery, backed by all the evidence contained in the steel trunks. Timely raids conducted on the premises of the RSS (Rashtriya Swayamsevak Sangh) had brought the massive conspiracy to light. The whole plot had been concerted under the direction and supervision of the Supremo of the organization himself. Both Jaitley and I pressed for the immediate arrest of the prime accused, Shri Golwalkar, who was still in the area. Pantji [G. B. Pant] could not but accept the evidence of his eyes and ears and expressed deep concern. But instead of agreeing to the immediate arrest of the ringleader as we had hoped, and as Kidwai would have done, he asked for the matter to be placed for consideration by the Cabinet at its next meeting. It was no doubt a matter of political delicacy as the roots of the RSS had gone deep into the body politic. There were also other political compulsions, as RSS sympathizers, both covert and overt, were to be found in the Congress Party itself and even in the Cabinet. It was no secret that the presiding officer of the Upper House, Atma Govind Kher, was himself an adherent and his sons were openly members of the RSS. At the Cabinet meeting there was the usual procrastination and much irrelevant talk. The fact that the police had unearthed a conspiracy which would have set the whole province in flames and that the officers concerned deserved warm commendation hardly seemed to figure in the discussion. What ultimately emerged was that a letter should be issued to Shri Golwalkar pointing out the contents and nature of the evidence which had been gathered and demanding an explanation thereof. At my insistence, such a letter if it were to be sent, should be issued by the Premier himself to carry greater weight. Panditji asked me to prepare a draft, which I did in imitation of his own characteristic style. The letter was to be delivered forthwith and two police officers were assigned for the purpose. Golwalkar, however, had been tipped off and he was nowhere to be found in the area. He was tracked down southwards but he managed to elude the couriers in pursuit. This infructuous chase continued from place to place and weeks passed. It was no different in 1992 when RSS had conspired to demolish a historical mosque at Ayodhya. It had given undertaking to highest court of Justice, the Supreme Court and the then PM, Narsimha Rao that it would not touch the mosque on December 6, 1992. But it remained true to its conspiratorial way and mosque was demolished without any remorse. Likewise, there are strong reasons that the burning of a sleeper coach of Sabarmati Express at Godhra railway station on February 27, 2002 in which 59 innocent passengers were burnt alive by a ‘mob of Muslims’ was a Hindutva conspiracy. It triggered genocide of Muslims in Gujarat and ensured victory of Narendra Bhai Modi as CM of Gujarat in December 2002. It was interesting to note that ‘Hindu reaction’ to ghastly killing of ‘kar-sevaks’ at Godhra remained confined to Gujarat only where assembly elections were due. There was no anti-Muslim violence in the heavily Hindu populated areas touching borders of Gujarat in MP, Maharashtra and Rajasthan. Who benefitted by the burning of coach at Godhra is an issue which needs deep study. Now with a government mainly constituted of RSS cadres this juggernaut of conspirators is in full steam. 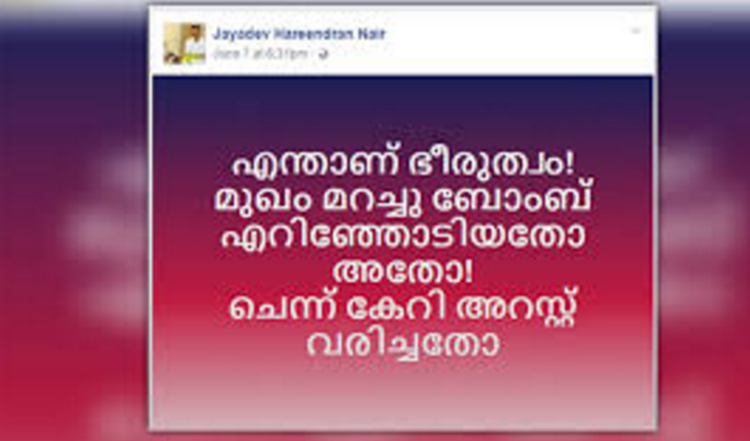 The latest conspiracy in Kerala is to defame the left-front government in Kerala and create a situation of instability which can pave way for central intervention. Such nefarious Hindutva politics can be checked only by a united response from Indians who are committed to a democratic-secular India. [ii] Sadanand Damodar Sapre, Param Vaibhav Ke Path Par, Suruchi Prakashan, Delhi, 1997, p. 28. [iv] Rajendra Prasad to Sardar Patel (March 14, 1948) cited in Neerja Singh (ed. ), Nehru Patel: Agreement Within Difference—Select Documents & Correspondences 1933-1950, NBT, Delhi, p. 43. [v] Rajeshwar Dayal, A Life of Our Times, Delhi, 1999, pp. 93-94. [vi]Justice on Trial, RSS, Bangalore, pp. 65-66. [viii]Letter 64 in Sardar Patel: Select Correspondence 19451950, Volume 2, Navjiwan Publishing House, Ahmedabad, 1977, pp. 276-277. The same rss is trying to appropriate sardar Patel as one of the proponents of hindutva ideology and the bjp is wasting no time in it’s attempt to lionise him. The rightwing party and it’s hindutva organiser groups tried to co-opt Ambedkar but failed and now, the case may be no different with Patel.